Many businesses have at least one department that is too big for one manager to oversee. Hiring another manager becomes necessary, but too often this causes conflict between staff. This becomes an increasingly difficult problem when you work in an environment that rapidly changes. However, there is an easy process that I encourage every business owner to follow when implementing a multi-manager office. Communication fails at some point in almost every business. It is difficult to remember to send one person an email when you’re currently speaking to someone else on the phone. As a business owner, general manager, or any other higher-up, it is your responsibility to make sure you are available first and foremost. Your new team of managers may struggle talking to one-another at first, so make sure you are a good resource. Then, find a great way for the managers to speak with each other in real time, such as Slack. This gives them the ability to collaborate without waiting for emails to be checked. Step 2: Give updates at once. Every team of managers should have a weekly meeting with their boss to go over any changes to their work and their employees’ work. This is the right time to give updates about new policies and procedures, and to receive updates about lower-level staff. Doing this will ensure that you and all of your staff are on the same page at the same time. Step 3: Set boundaries with their employees. If the office is used to having one manager, you will need to introduce them to the idea of having two. Speak directly to your employees and explain each manager’s role. If they will be splitting up the office into teams, make sure everyone is aware of who they report to. If the managers will split up the work of one person, but manage the entire team, your team will need to know which manager is involved in which tasks. Otherwise, there will be more time spent directing employees to the right person than solving any problems. Step 4: Consider creating different positions. If the managers are going to split up responsibilities, why not consider creating two or more different position titles that explain what they do. For example, a manager who handles technical issues and customer complaints would have a different label than the manager who handles personnel. Your employees will have a better understanding of who is in control of what, and the managers will be able to step in and fix problems faster, knowing their boundaries. 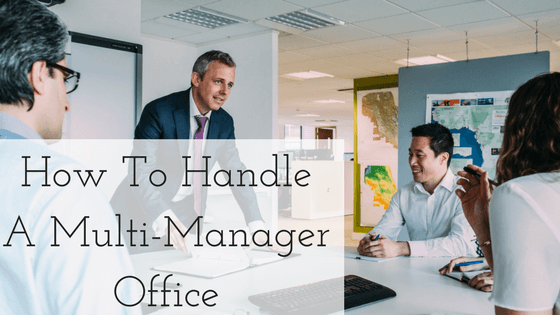 Working in a multi-manager office is difficult and comes with some roadblocks. Follow these steps to ensure that your employees do not become confused, your managers do not squabble over responsibilities, and your office runs smoothly.